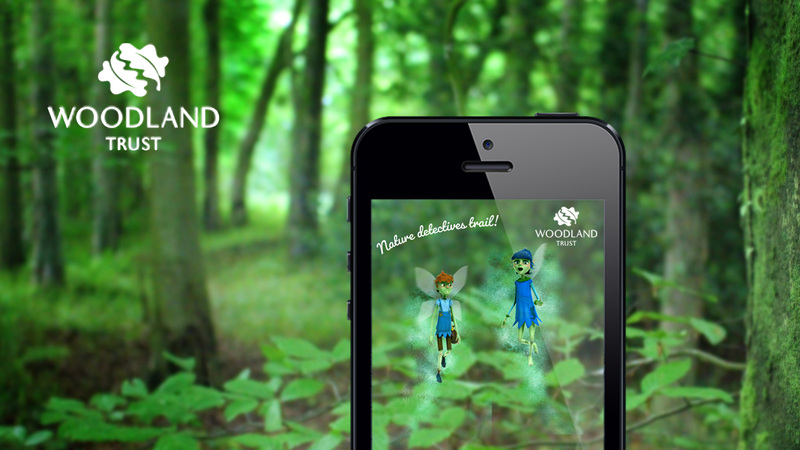 To create an AR app that would encourage families with young children to get out and enjoy a walk in one of 25 Woodland Trust sites around the UK at springtime while being careful not to trample on the newly emerging bluebells. We created animated characters Blue and Belle who appeared via image tracking AR at key points along the trail to tell their tale of the clumsy giant who kept trampling the bluebells and destroying the springtime magic that they collected. The trail gave children between 4 and 7 hands on activities to do around the woods, together with some in-app games to collect bluebell chimes and shout spells loudly. We incorporated an opportunity to share pictures on Facebook and Twitter and for the Woodland Trust to gather visitors’ email addresses for follow-up marketing and future campaign engagement. We also incorporated an image tracked animation and game to appear, triggered by an image on the Nature Detectives activity pack that was sent out as a reward for completing the trail. The app was hugely successful with over 4000 downloads during the the first few weeks of its launch. It was rolled out again the following year with a similar level of uptake.